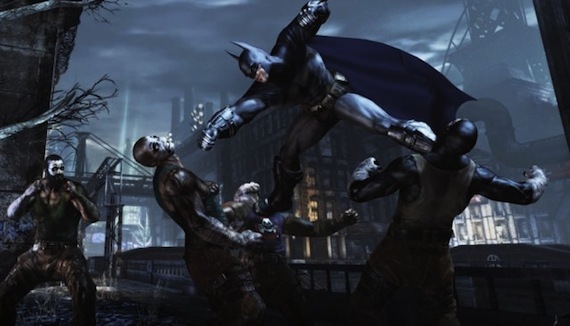 Batman: Arkham City is easily as addicting as any narcotic. After buying it last week, my XBOX 360 controller has become permanently fused to my hands. The numerous fights and melees, which happen frequently and at the drop of dime, are enough to have ones thumbs and forefingers in a perpetual state of cramped exhaustion. The Thousand Pounds Fight Team admittedly knows such addiction all too well, and has decided that merely playing the game is not enough. The next logical step is to enter the game grid and try ones luck on Gotham’s streets. In keeping with that spirit, they have put together a test video which aims to accurately recreate the combat style and camera angles of the game. It’s set to the strains of the “Arkham City Main Theme” by Nick Arundel. Altogether, it’s an aesthetically accurate recreation of the game. Now if only they could build a time travelling Delorean, go back to when The Dark Knight was still in the planning stages and hand Christopher Nolan this test footage as an audition reel. Maybe he would have taken the hint. Thank you so very much! I've been echoing the same sentiment regarding Nolan's vision versus the spirit of the property. The animation Batman Under the Red Hood, another fine work that proves the Nolan Batman franchise to be lacking. Kudos, excellent find.